So, it is really, really happening. I will have my very first stall at Wool@J13 in May! It is booked, and I am in the throes of organising my stock. I will, of course, be bringing my patterns, but I am putting together a sort of pick and mix feel to me stall: pick a pattern, pick a yarn, pick some extras and have them all beautifully wrapped for you, so you have a treat for when you get to open it all again later at home. Having helped out Sam and Sue on their stands, it seems that a lot of people like to see what is in their kit boxes before they buy them. So I decided the easiest thing would be to let people build their own kits, and make them as special as possible. I have commissioned some yarns from Unbelievawool and Dye Candy, all on a psychological theme, and the testers look pretty special (the ones shown above are from Dye Candy). I am hoping to ask some of other dyers to contribute as well, but I don’t want to get too carried away for my first show. But I hope to be able to support some of my other favourite dyers too. I have some hand made stitch markers already from Tinkaboo Crafts, and I have found some amazing fabric for project bags which also keeps with the psychological theme. All brains and neurons! I know they won’t appeal to everyone but I think the fabric looks pretty amazing. A friend is helping me by making them this time, but I plan to make some myself in future if I can find time (time is my enemy at the moment). So my extras will be hooks, stitch markers (I hope to get some very special ones made to go with the ones I already have), and WIP bags. I am trying to source some shawl pins too, and keep toying with the idea of a small amount of things which feature my logo. What do you think? 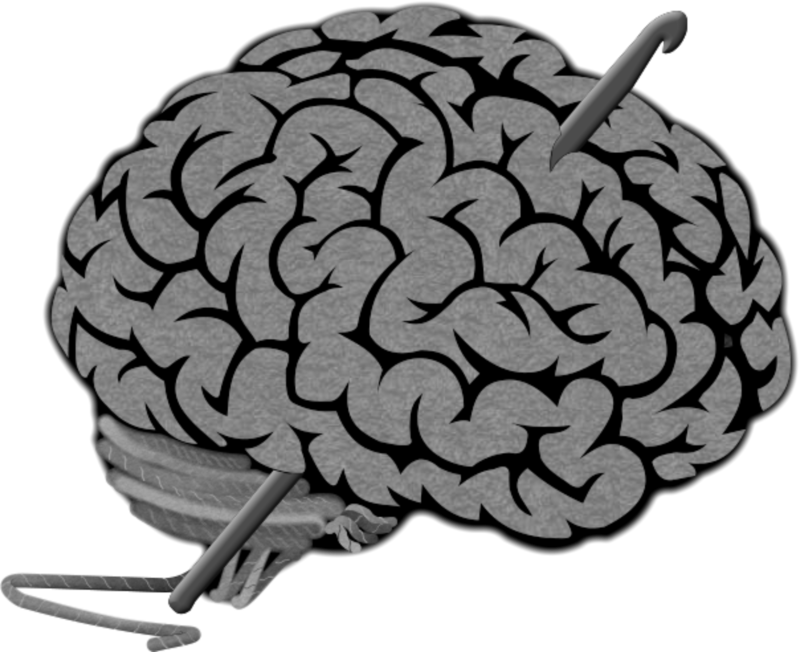 Do people like the idea of my little frazzled brain as a badge or a pin? Let me know! I’m going to introduce a new feature, entitled ‘Stashdive Sunday’, and this week I wanted to kick it off by honouring the substantial contribution that Rox Driver has made to my stash, aka Lollipop Guild Yarns. Based in Nottinghamshire, she has produced some of my most beloved yarn pets and even inspired the creation of the Moo-Ra dress (I still have to finish writing that pattern up!). But the reason I want to honour her today is because it is her birthday, and I wanted to really embarrass her. So I am going to restrict myself to some featured beauties from my DK and Aran stash, all dyed by her, and I apologise that my poor lighting really doesn’t do the colours full justice. This next one was a custom dye and everyone who has seen the brioche it got used on comments on how fabulous the blue is. It is multi tonal, both dark and intense and yet bright and vivid all at the same time. No, I don’t know how that it possible either.. I have so many more of her yarns in my stash, and I would encourage you to watch her Etsy shop like a hawk. She also has a pretty good blog which I would recommend just so that you can drool over her yarn boxes as she reveals them.